The 2015 Rawlings Velo end-loaded version is the same exact exterior shell as the hand-loaded version of the bat but its internal weight is distributed more towards the end cap. From a measurement stand point it weighs in as one of the lighter ‘end loaded’ bats for 2015. Not nearly as… Jump to the full review. We aren’t the only ones to have information about the Velo. Other places, in particular those who sell bats, usually have a boiler plate write up on the specs of a bat. Many of those we reference to make sure we are seeing what we should be. Here are some more references for the 2015 Rawlings Velo review. 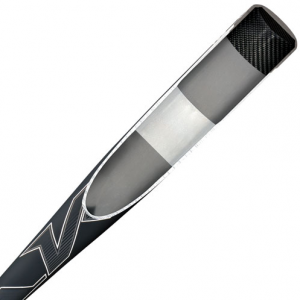 The 2015 Rawlings Velo end-loaded version is the same exact exterior shell as the hand-loaded version of the bat but its internal weight is distributed more towards the end cap. From a measurement stand point it weighs in as one of the lighter ‘end loaded’ bats for 2015. Not nearly as heavy to swing as Easton’s XL1 but with a little more drag than Baden’s Axe Avenge. The 2015 Rawlings Velo hand loaded version (BBRVB) is a durable and proven bat from a great company with a solid warranty. Those looking for a hand loaded bat should start real close to here–if not exactly here. The only caution we submit is that the 2015 is exactly the same as the 2013 and 2014 versions (with the exception of the paint job). Those who think the Rawlings Velo is the right bat from them should try and find a 2014 or 2013 version like maybe here? If you want brand new then here is a good place to start looking. The bat has so much weight in the handle it feels almost strange the first time you swing it–especially if you’ve spent a lot of time swinging other bats also labeled balanced like the Marucci Cat 6 (which we think is a true ‘balanced’ bat—not hand-loaded). Swinging the hand-loaded version of the Velo is especially remarkably if you swung a lot of end-load like the 915 Prime from Slugger or DeMarini’s OverLord FT.
Rawlings’ claim that the light swinging VELO version is in a “class of its own” due to the effect the bi-fusion end cap helps them create is a bit of a stretch. Our measurements showed DeMarini’s CF7 and Anderson’s Flex to have similar swing weights–although all three are clearly in the hand-loaded category with the Flex as #1, Velo as #2 and CF7 as #3 (according to our calculations). I’ve long suggested we fix this industry wide problem by adding a third category to the spectrum: hand-loaded. Not only does a hand-loaded bat sound awesome, but it really drives home the point that a hand-loaded bat is made to force hands through the zone as fast as possible. Accepting that third category of bats allows me now to say with some degree of clarity that the 2015 Rawlings Velo comes in both a hand-loaded version (BBRVB) and an end-loaded version (BBRVE). Both of these 2015 versions are just like their previous year iterations with the exception of the paint job. Both versions are also one-piece 5150 alloy bats. Only the hand-loaded version, however, comes in a Senior League (2 5/8 barrel) bat with drop 5, drop 9 and drop 10 available. As well, the hand-loaded version comes in a 2 1/4 barreled youth drop 13. The end-loaded version is only in BBCOR in 33 and 34 inch lengths. Both versions also boast a “bi-fusion” process to weld Rawlings’ famous comp-lite end cap to the 5150 aluminum barrel. This is a fancy of way of saying they fused the carbon composite end cap into the barrel. A carbon composite end cap seamlessly fused into the end of the barrel gives the bat a chance to have very little weight at the end of the stick–hence the hand loaded version of the Rawlings Velo. Let’s start here to review the 2015 Velo: An end-loaded bat, in relation to a balanced bat, contains more drag as it’s swung because a greater portion of its mass is situated towards the end cap–hence the “end-loaded” title. A balanced bat, on the other hand, has its weight distributed closer to the handle and, hence, takes less strength to manipulate the barrel when compared to end loaded bats. The lesser tension required to control its barrel gives the bat the ‘balanced’ name. While the categories of end-loaded and balanced are helpful at first glance, we’ve found them far from completely instructive. Such broad categories do little to define the full spectrum between its two points. As well, we don’t think the word “balanced” quite captures the opposite of end loaded. The benefit of the fused carbon composite end cap on an aluminum barrel is to create a bat with a really low swing weight. Which begs the question as to why Rawlings goes through the trouble of making a light swinging bat exterior and then fills the end cap with weight to make it an end-loaded feel in the BBRVE? Players looking for tons of control in their bat will greatly appreciate the BBRVB–which, on second thought, should be BBRVHL. With that added control comes the potential for more bat speed which is more helpful for everyone. At the expense of that control, it should be noted, the bat clearly lacks some gumption at collision. (Although the car wreck type sound every time you make contact makes some players think differently). Swing weight is inversely proportional to power at collision and some players avoid the light swinging VELO for that very reason. This doesn’t mean the Rawlings VELO light version isn’t recommendable. For the right hitter it is clearly a great choice–which several have made for the last several years. But guys who have begun peaking out in the weight they swing might find their extra base hits turn into singles.